The château du Haut-Knigsbourg is a medieval castle located at Orschwiller, Alsace, France, in the Vosges mountains just west of Sélestat. It is situated in a strategic location on a rocky spur overlooking the Upper Rhine Plain; as a result it was used by successive powers from the Middle Ages until the Thirty Years' War when it was abandoned. From 1900 to 1908 it was rebuilt at the behest of the German emperor Wilhelm II. Today it is a major tourist site, attracting more than 500,000 visitors a year. 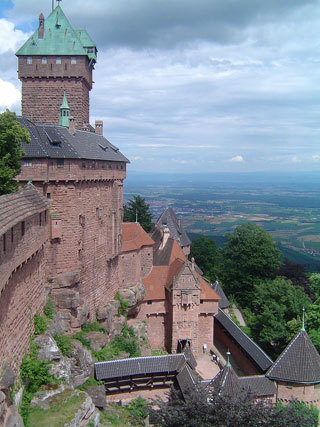 This article uses material from the Wikipedia article "Château du Haut-Koenigsbourg", which is released under the Creative Commons Attribution-Share-Alike 3.0 License.